With the cold weather settling in on the city of Toronto, we’re taking one last look back on the pleasanter days of September, when the Brain Injury Society of Toronto hosted its second annual 5K Run Walk and Roll. Of course, the weather wasn’t exactly perfect that day, either, but that didn’t keep the runners and volunteers away. BIST communications committee volunteer Richard Haskell was there to capture the mood. Runners set off at the start of BIST’s 5K Run, Walk and Roll. Photo by Ian Bowles. The forecast called for “intermittent showers,” and that’s exactly what was happening during the early morning hours of Saturday, Sept 22. 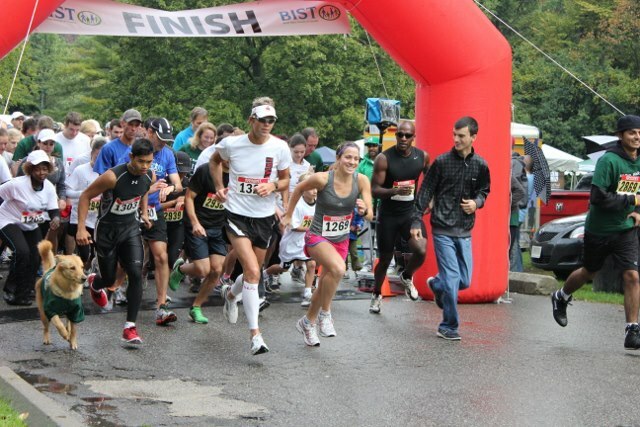 Nevertheless, by 9:55 a.m. the sun began peeking through the clouds just in time to mark the official start of BIST’s 5k Run Walk and Roll, the organization’s second annual run in Sunnybrook Park. 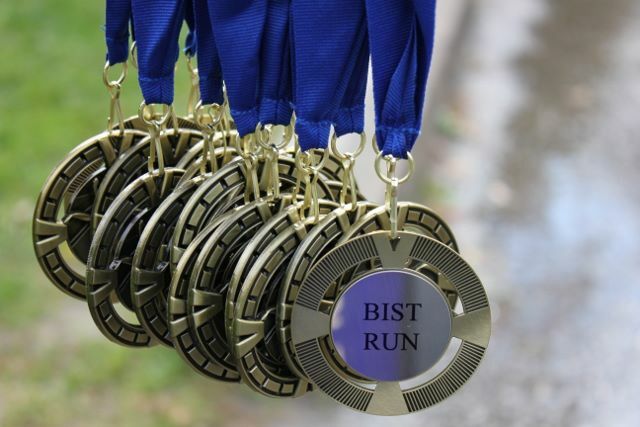 What had motivated more than 300 participants — including adults, children, and a couple of canines — to come out and run, walk or roll for BIST? The reasons were as varied as the participants themselves. Lisa Cybulskie, who clocked in at 18:38 and placed first in the women’s category, is a keen amateur runner who happened to be taking part in a marathon on the same course later this fall. Top men’s winner was John Healy, who referred to himself as a “runner, lawyer, husband and dad” who completed the course in 19:17. This was his first year running the 5K race, and because he has friends with acquired brain injuries (ABIs), he felt an obligation to participate. Second–place men’s winner Adam Morello is a marathon runner, soon to be participating in a major competition. Some participants were ABI survivors themselves, including fifth-place finisher Jeff Bryce. The 36-year-old lawyer suffered a traumatic brain injury in 1992 when a pickup truck rolled over while he was working on a project in Guyana. Kudos also go to the gentleman who was pushed by a friend in a wheelchair for the entire 5K. This year’s event was even more successful than the inaugural one held last year, with 350 registered to take part, and more than $45,000 raised for brain injury-programs. Volunteers directed by Cora Moncada began arriving around 8am to help set up, and their ongoing efforts throughout the day proved valuable. They moved tables, stuffed bags, worked at the registration and food tents, watched over children, and generally kept the whole event running smoothly from start to finish. This year’s special guest was Kathleen Wynne, MPP for Don Valley West. In a brief speech, Ms. Wynne spoke of the need for increasing knowledge surrounding ABIs. “Because so much information concerning brain injuries is still misunderstood, there’s a tremendous need for greater awareness,” Wynne said. A deejay spinning dance tunes kept the atmosphere lively throughout the morning and assisted with the warm-up activities provided by a fitness instructor just prior to the race. After the race had concluded, participants, volunteers, and onlookers enjoyed some enticing food and drink in the way of fresh fruit, sandwiches, doughnuts and bagels in addition to bottled water and coffee. A big thanks to all the sponsors, the planning committee, volunteers, staff, and of course, the runners, walkers, and rollers.